Central Jakarta Library and Archive Sub-dept., commemorated Teacher's Day by organizing Caring for Literacy Action, in the Mutiara Sumur Batu RPTRA, Sunday (11/25).
" We invite students to prefer reading. In addition there are also coloring competitions, as well as performances of storytelling and poetic abilities"
It was participated by around 100 students of kindergarten and elementary school. "We invite students to prefer reading. 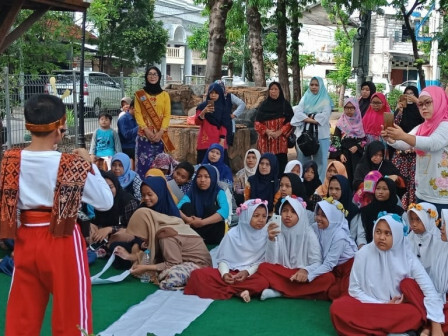 In addition there are also coloring competitions, as well as performances of storytelling and poetic abilities," expressed Tanwil, Head of Central Jakarta Library and Archive Sub-dept. He hoped that it could become a stimulus in an effort to encourage reading fondly for children. For this reason, Abnon Buku 2018 was also involved in transmitting the virus to reading. "We also give appreciation to the teachers who accompany their students to continue the spirit of disseminating knowledge that is beneficial for the progress of the millennial generation in the future," he stated.